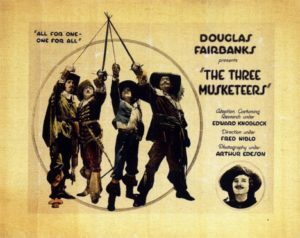 Douglas Fairbanks, Sr.’s Three Musketeers is far and away the best of the seven versions filmed in the silent era—but more about that in a moment. First I want to gush about this production’s costumes, which are fabulous, both historically accurate and theatrically gorgeous. This film was another Fairbanks production, and after the worldwide success of The Mark of Zorro, no expense was spared in an attempt to duplicate that triumph. And boy, did they succeed. The costumes and sets show that serious attention was paid to getting the details right, and I noticed settings and tableaux inspired by 19th-century paintings of the period, as well as the engravings of Maurice Leloir, Dumas’s most celebrated illustrator. Fairbanks was nearly forty in 1921, far too old for the part of the youth d’Artagnan, but instead of trying to look young he plays young, in his expressions and body language, and does so brilliantly. Fairbanks made his Zorro an acrobat, and he does the same for d’Artagnan, leaping and fencing with a buoyant athleticism that has been attached to the rôle of the young musketeer ever since. But beyond that, Fairbanks’s d’Artagnan exhibits the sharp wits and quick thinking on display in Dumas’s novel, crucial aspects of the character that are often overlooked in lesser adaptations. Once again, the film covers only the first half of the novel, the affair of the diamond studs, but with 121 minutes to do it, this version has much more room for character interplay, romance, and joyous musketeer shenanigans. There is roistering, roguery, and outright piracy on the English Channel. This time around Constance is Bonacieux’s niece rather than wife, and she gets a generous amount of screen time in a movie that’s otherwise a boys’ club. But the real supporting-actor prize goes to Nigel Brulier as Cardinal Richelieu, whom he plays as a cold and calculating automaton with a genuinely ominous screen presence. In the end Richelieu reacts to his defeat with dignity and even generosity, but is rebuffed by d’Artagnan and the musketeers, who prefer their camaraderie and half-drunken revelry to the sober demands of the state. You go, frat boys!